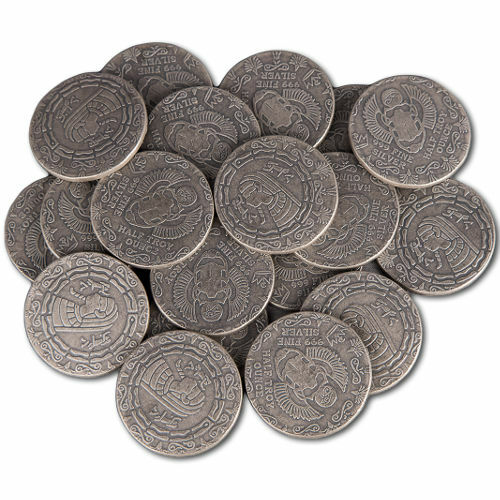 Available as low as $1.29 per round over spot! The popularity of silver rounds is higher than ever before, and mints around the globe are responding with mint-branded and unique designs to suit the needs of investors and collectors alike. Monarch Precious Metals offers both, but excels in particular at creating remarkable designs for collectible silver rounds. 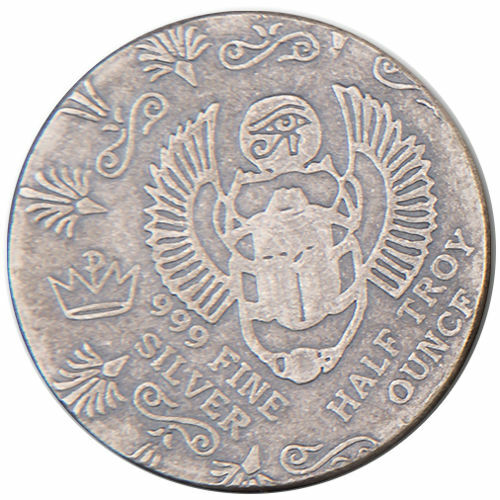 Silver.com is now offering the ½ oz Silver Monarch Egyptian Round for purchase. All-new design from Monarch Precious Metals. Hand-stamped design sets with antique finish. Ships to you in a plastic flip or bags of 20 rounds. 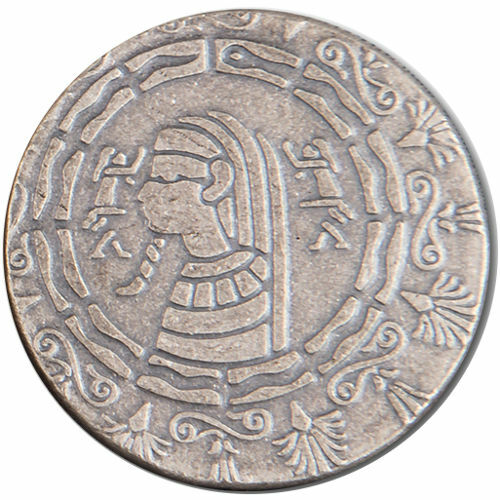 Features a unique Egyptian mummy design on the obverse. Scarab beetle on the reverse of the round. These ½ oz Silver Monarch Egyptian Rounds from Monarch Precious Metals are truly unique. All of Monarch’s silver and gold bars are hand-poured and hand-stamped for a rustic, one-of-a-kind appeal. That same concept has been applied to these rounds. Each obverse and reverse design set has been purposely hand-stamped slightly off center, giving each round its own individual appeal. 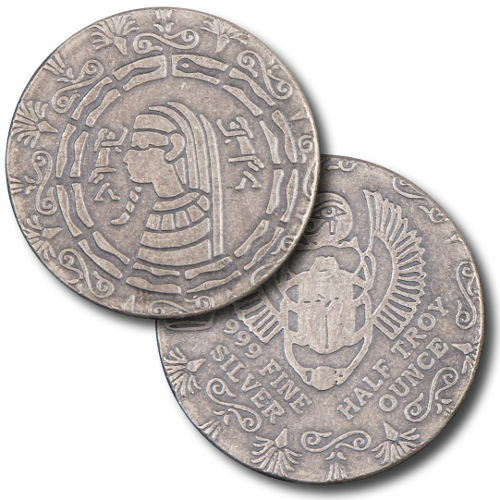 On top of that, these ½ oz Silver Monarch Egyptian Rounds feature an application of anti-polish and antiquing chemicals to give the rounds a sense of old-world charm. 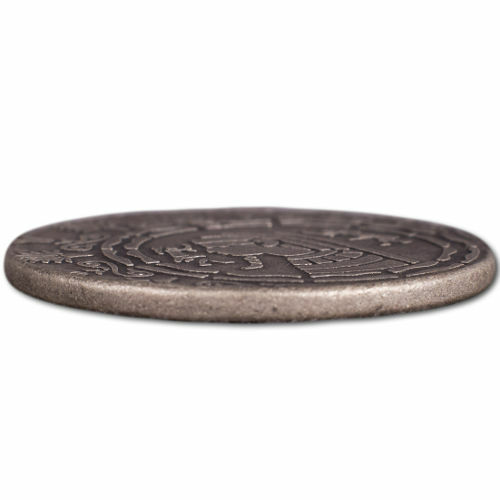 Antique finishes generally add the appearance of years of circulation for a round or coin, while creating subtle depth and warmth in the design. 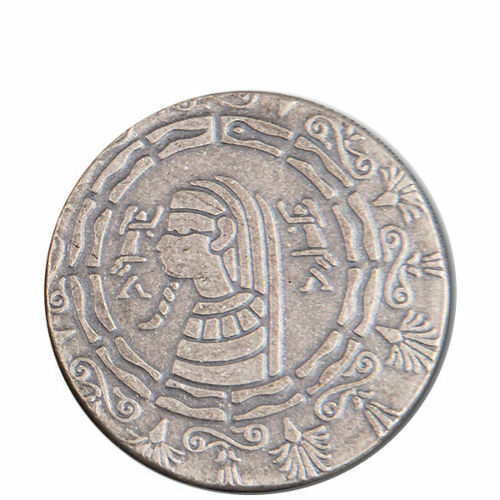 The obverse of each of these silver rounds features the left-profile image of an Egyptian mummy, along with a variety of sample Egyptian hieroglyphics that add to the overall imagery of the silver round. On the reverse of the ½ oz Silver Monarch Egyptian Round you’ll find the central image bearing depictions of the scarab beetle and the Eye of Horus. Known as the Scarabaeus sacer, the scarab beetle is a species of dung beetle that was worshiped by Ancient Egyptians as a symbol of Khepri, the early morning manifestation of the sun god Ra. Monarch Precious Metals opened its doors for business in 2008. Located in the southeastern reaches of Oregon, in the Rogue Valley, Monarch hand-pours and hand-stamps all of its gold and silver products with a minimum fineness of .999 purity. If you have any questions, please don’t hesitate to reach out to Silver.com. You can contact our customer service team on the phone at 888-989-7223, online using our live web chat, or via our email address.